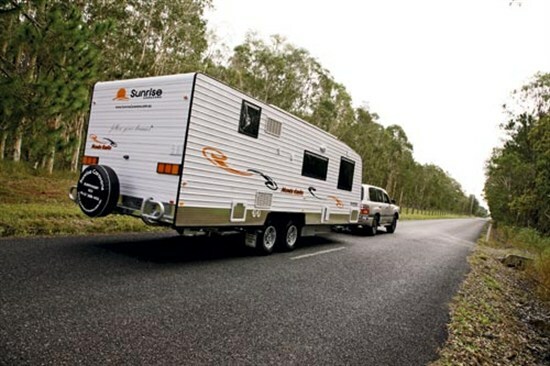 At Brisbane-based Sunrise Caravans, large luxury caravans are the order of the day. 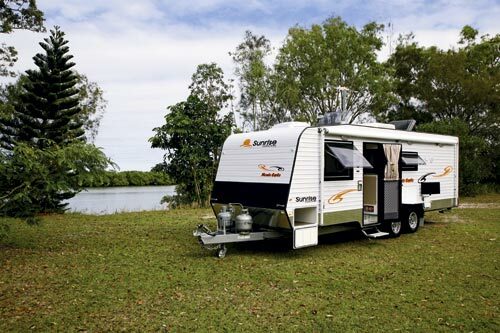 Sure, Sunrise does make smaller vans, but there’s a definite emphasis on vans such as the exotically named Monte Carlo, one of the latest in the Sunrise range. The Monte Carlo’s standard layout, with its front bedroom, nearside kitchen, offside dinette and rear bathroom, is about the only ‘standard’ part of this van. The interior is beautifully designed, combing form and function with an exquisite colour scheme, giving this van a very high-end feel. 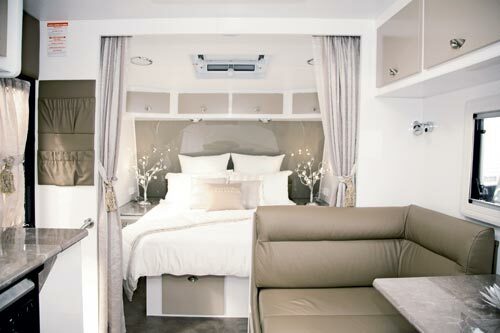 The colour palette is beige, brown and white, which might sound a bit dull but it’s brilliantly done – the beige doors contrast perfectly with the white cabinetry/walls and the brown leather upholstery on the seats and door adornments. Relatively speaking, the smallest item in this van is the front tunnel boot but it’s actually quite a reasonable size given the two 105Ah batteries are mounted in a housing fitted to the front offside chassis rail. Despite its length, the Monte Carlo glides around corners and handles bumps in the road without a problem. For its size, it isn’t particularly heavy at 2640kg Tare, but it does have a substantial load capacity of 860kg, which is great given the storage space inside! 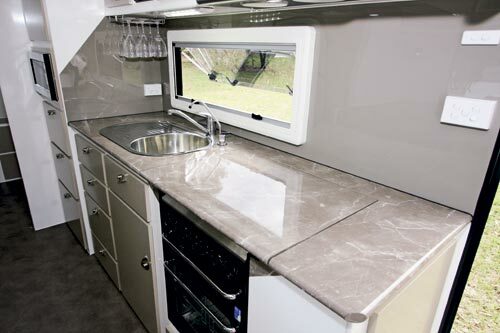 On the opposite side of the van, the kitchen bench has the full kit: full stove setup, stainless steel sink, microwave at a user-friendly height and even a wine glass rack. Bench space is on the moderate side but drawer and cupboard space is prolific. I particularly liked the drawers and cupboards above and below the microwave, as well as the open shelves at the entry-door end of the bench. Completing the picture is a full-height wire basket pantry and 186L fridge. 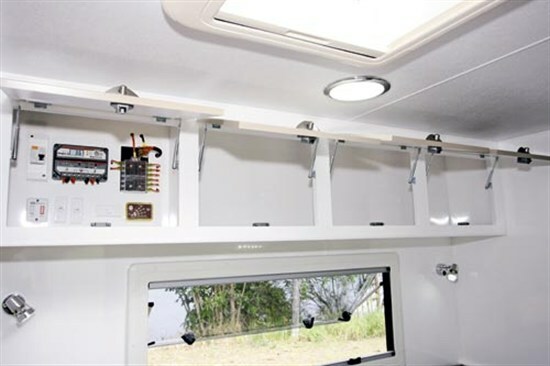 Like many other features of this van, the rear bathroom is quite large. 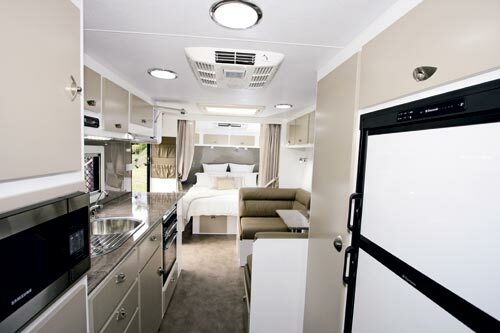 It’s been designed to accommodate a large two-door wardrobe with drawers, as well as a washing machine. The usual bathroom items, such as the corner shower cubicle and toilet, are both on the offside, which leaves the vanity cabinet along the nearside wall. 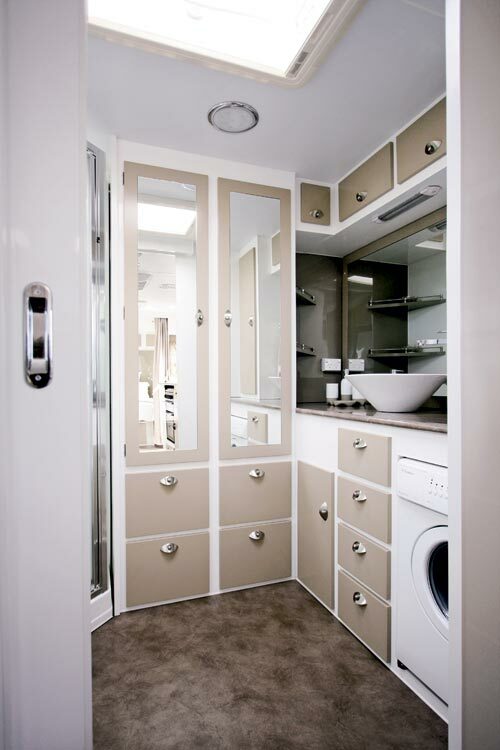 The vanity’s size not only allows for a washbasin but also a good selection of drawers, the washing machine and a large wall mirror. Bottom line: there’s an abundance of storage space in this bathroom. The Monte Carlo rides on a SupaGal chassis with 150x50mm rails and drawbar, and built in the box section style. The two 95L water tanks are fitted fore and aft of the suspension, affording a good chance of keeping the water weight reasonably balanced. The 15in wheels ride with standard load-sharing leaf-spring suspension. At the front, the drawbar has all the usual towing items plus two 9kg gas cylinders and a mesh rack. 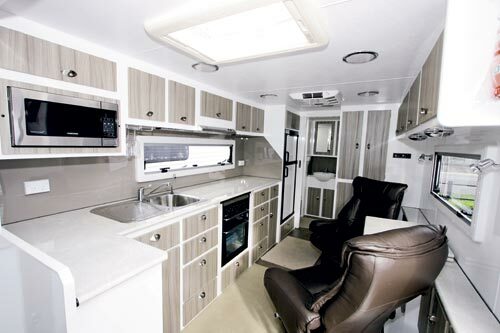 There are no surprises in the body construction department – it comes with a meranti timber frame, insulation, aluminium cladding and a lower waist of polished alloy checkerplate. The words Monte Carlo conjure up an exotic location and although this van (or any other van, for that matter) is unlikely to be seen at Monte Carlo, it’s aptly named. The spacious layout and nice little luxury touches make this Sunrise van a rolling Monte Carlo – except for the casinos, that is! Dinette footrests – it has everything else!